In the tradition of The Anti-Gravity Handbook and the Time-Travel Handbook comes this compilation of material on anti-gravity, free energy, flying saucers and Tesla technology. With plenty of technical drawings and explanations, this book reveals suppressed technology that will change the world in ways we can only dream of. Chapters include: A Brief History of Anti-Gravity Patents; The Motionless Electromagnet Generator Patent; Mercury Anti-Gravity Gyros; The Tesla Pyramid Engine; Anti-Gravity Propulsion Dynamics; The Machines in Flight; More Anti-Gravity Patents; Death Rays Anyone? ; The Unified Field Theory of Gravity; and tons more. The book that finally blows the lid on suppressed technology, zero-point energy and anti-gravity! Heavily illustrated. 4-page color section. 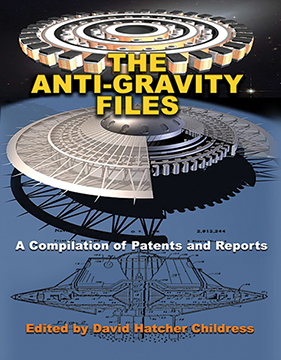 THE ANTI-GRAVITY FILES: A Compilation of Patents and Reports Edited by David Hatcher Childress. 216 pages. 7x10 Paperback. Illustrated. Color Section. References.